It’s Monday so it must be fast day :-). I am beginning to look forward to it because I actually enjoy feeling empty, especially after a weekend like I just had which involved lots of eating. I skipped breakfast quite effortlessly, thanks to several cups of tea. It is definitely harder fasting after you have drunk a little bit too much and eaten rich food. So I used 106 calories on 225 mls semi skimmed milk which I added to tea and a coffee and that got me through the morning. By early afternoon I was ready for lunch. I wanted to eat a lot of healthy nutrients so I went for some foods full of vitamins, minerals, phytonutrients, antioxidants etc. Yes, vegetables plus some fruits. 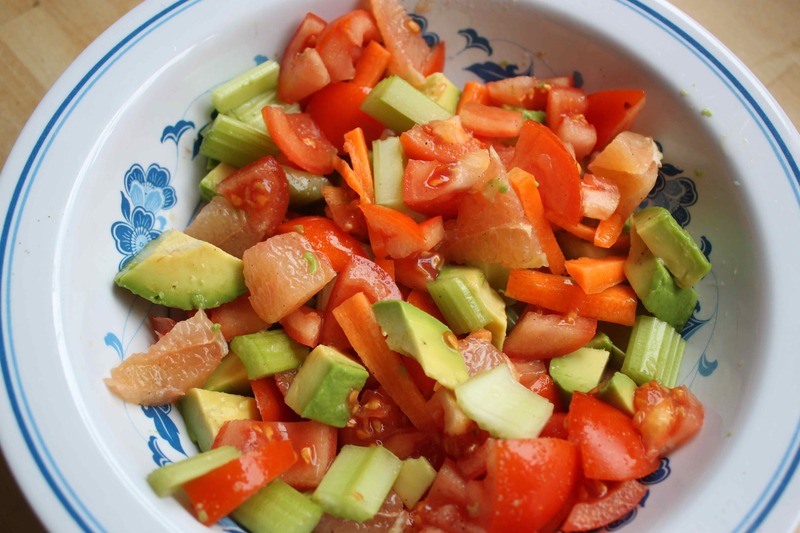 The basis of my lunch time salad was half an avocado and half a grapefruit. 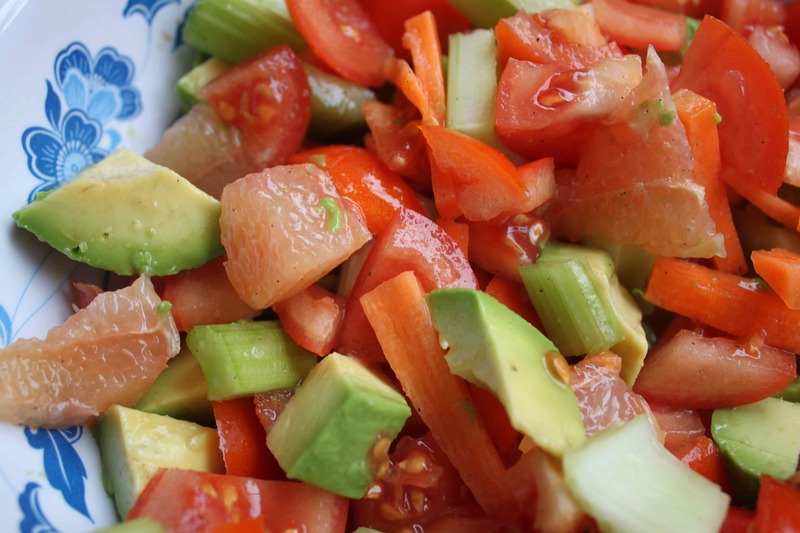 Instead of lemon or lime juice, I used the lovely juicy grapefruit to stop the avocado turning brown. 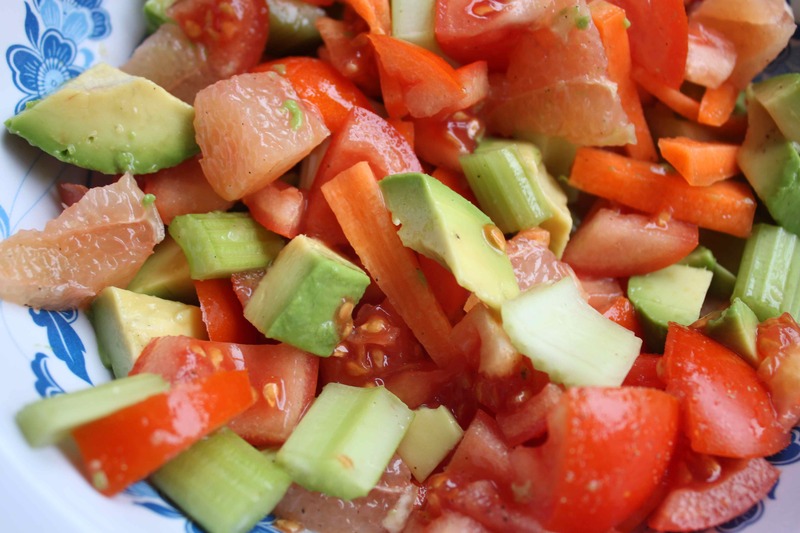 I put that in a bowl with 2 sticks of celery, 1 carrot and 3 medium sized tomatoes. No dressing other than salt and pepper. 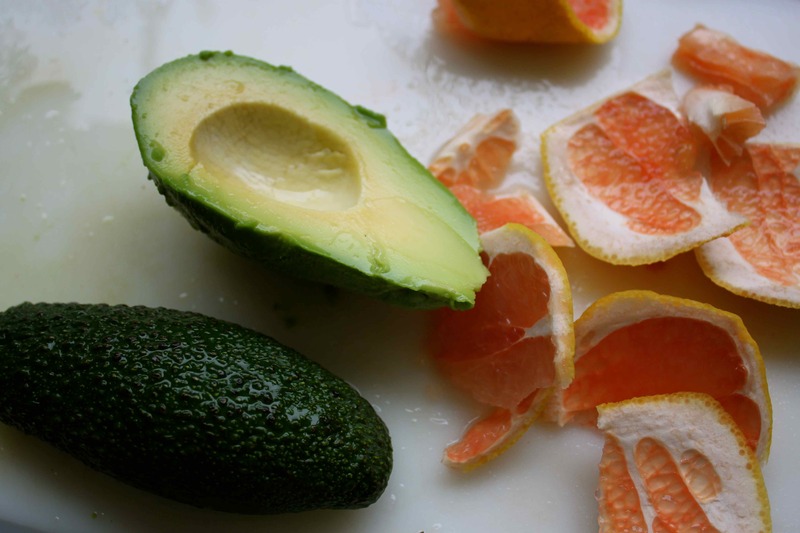 I wouldn’t say that grapefruit and avocado make a complementary flavour pairing necessarily. But they do look pretty together. This lunch was slowly munched while I worked at home. 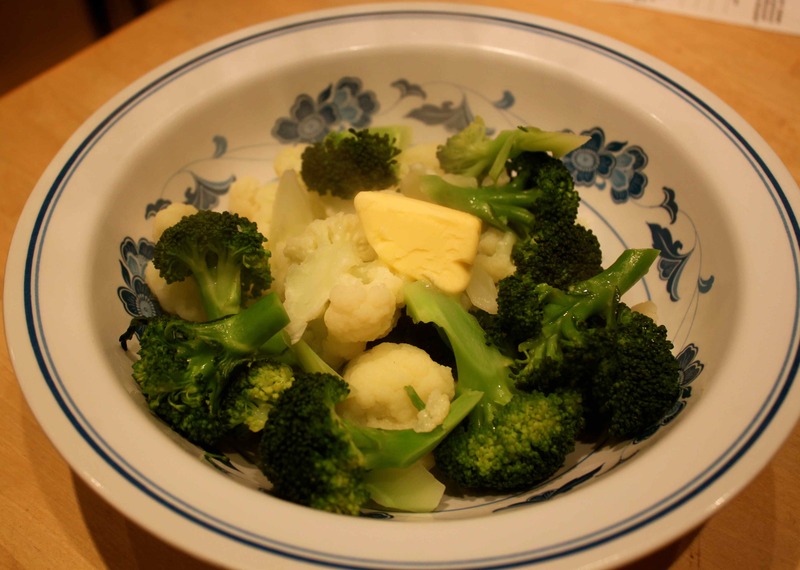 I had 175 calories left for supper which I used on some lightly steamed broccoli and cauliflower and 10 g butter. Simple, quick and easy to make and it tasted good too. I have realised I under-estimated my sodium intake as I did not add the slt I sprinkled on my salad or dinner. I don’t add much but I did add some. I am astonished that such a healthy day of eating put me over my daily recommended sugar allowance!!!!! 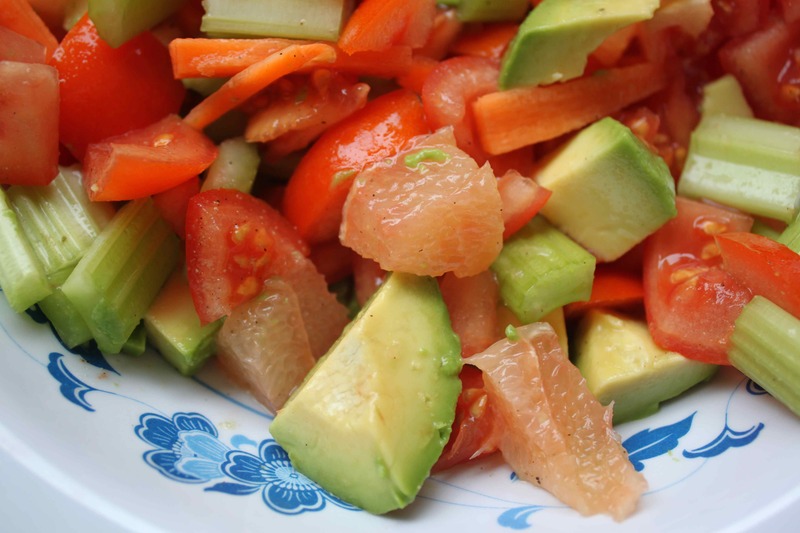 This entry was posted in Uncategorized and tagged Avocado, Pink Grapefruit. Bookmark the permalink. Zoe when I joined MFP I really didn’t do it to count calories per se. I honestly did it to keep track of my sugar consumption, even though I don’t eat refined sugar generally, but because of the large amount of natural sugar that is in fruits, honey and even vegetables as well as the sodium because of heart disease which my Dad and his side of the family suffered and lost their battles to. They say that knowledge is power and I say knowledge is information with a choice. I really am amazed at how much sugar I ate when I don’t even think I ate anything sweet today! That is what gives you the extra information of “why I diet and am not releasing weight.” Sugar and Sodium and everyone just concentrates on Carbs these days.